Smokers under 50 are EIGHT times more likely than non-smokers of the same age to have a major heart attack. This is the finding from research conducted by the South Yorkshire Cardiothoracic Centre in Sheffield, England. They add that it is difficult to explain the much higher risk of acute heart attack among younger patients but that the results should be a wake-up call to young smokers. The study examines data from 1 727 adults who underwent treatment for a common type of heart attack known as a STEMI (ST-segment elevation myocardial infarction) between 2009 and 2012. A STEMI is a full-blown heart attack caused by the complete blockage of a heart artery and loss of blood supply to the heart beyond that point. When this happens the heart muscle stops working within minutes and dies within minutes to hours unless the artery can be opened back up. The study found that across the South Yorkshire population 27% of adults under the age of 50 smoked but that 75% of the patients under 50 who had suffered a STEMI heart attack were smokers. It was also noted that smokers, on average, were at least a decade younger than ex-smokers when the heart attack struck. 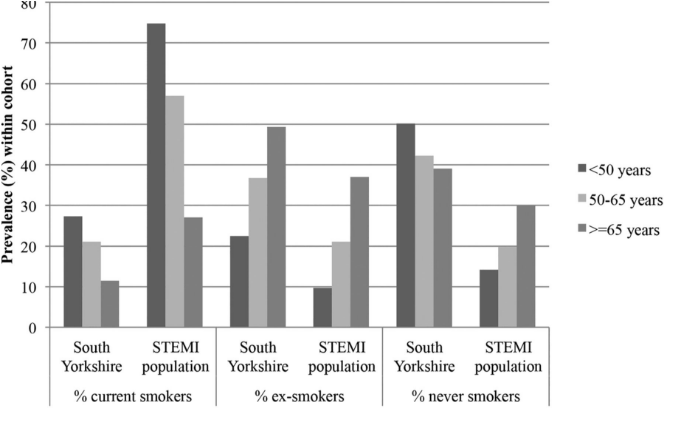 Smoking prevalence (%) within the ST-segment elevation myocardial infarction (STEMI) cohort and in South Yorkshire derived from Office for National Statistics Integrated Household Survey (ONS-IHS) responses. Copyright © BMJ Publishing Group Ltd & British Cardiovascular Society. All rights reserved. What became clear from the study is that younger men and women who typically do not have as many of the health problems, such as hypertension, high cholesterol or diabetes, normally associated with an increased risk of heart problems, expose themselves to the most powerful of all risk factors by smoking and this risk factor exerts its effect much earlier than any other. The study concluded that survival following STEMI among smokers has not improved over the past decade despite corresponding changes in management strategies which have greatly improved prevalence within ex-smokers and non-smokers. Cardiologist Yaron Arbel, writing in the same journal, said that the goal must be to help younger smokers quit smoking. All current smokers must be encouraged into smoking cessation therapy to reduce their risk of acute STEMI, with a focus on the youngest smokers whose increased risk is often unrecognised. Convincing younger smokers to stop smoking can be extremely challenging especially as the younger smokers may not appreciate the risks associated with smoking, probably don’t suffer any disabling effects from smoking as yet and do not have the usual cardio-vascular risk factors for heart attack. It is unlikely they appreciate the benefits of stopping smoking and if they do try and stop the nicotine withdrawal is unpleasant. Evidence shows that the best way to quit smoking is through a full stop smoking programme that combines support, nicotine replacement therapy or other stop smoking medication and behavioural modification. Gosmokefree is fully supported stop smoking programme that uses the proven combination therapy. The Gosmokefree programme greatly increases a smokers chances of stopping smoking when compared to a smoker who attempts to quit cold turkey.